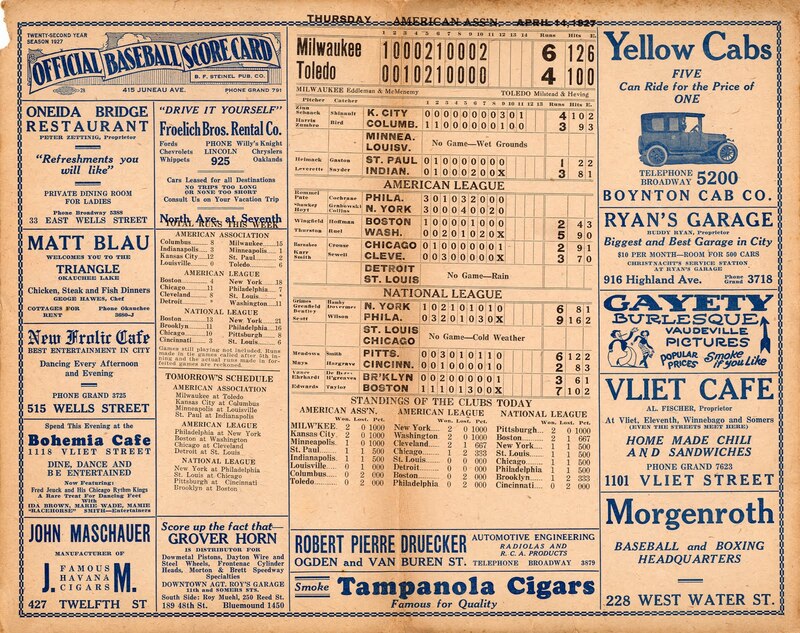 This 11x14 two-color cardboard scoresheet is a little slice of Milwaukee baseball history. 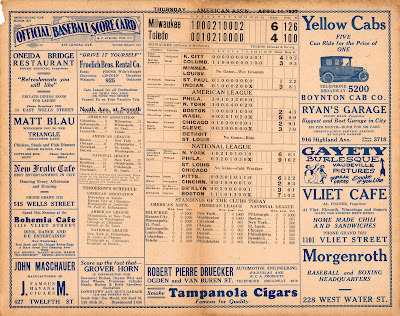 Cards like these were published by the B.F. Steinel Publishing Company and circulated around Milwaukee taverns to keep baseball fans up-to-date on the previous day's scores. This particular card was printed on Thursday, April 14, 1927. The previous afternoon, the Brewers had defeated the Mud Hens in Toledo 6-4 behing the pitching/catching battery of Joseph Eddleman and Robert McMenemy. Five can ride for the price of one! 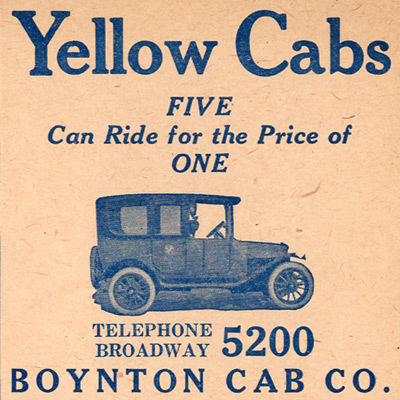 I have a fair number of these in my collection, but chose to begin our review with this one solely for this picture of the taxicab. I've never seen these tavern cards published anywhere but Milwaukee. 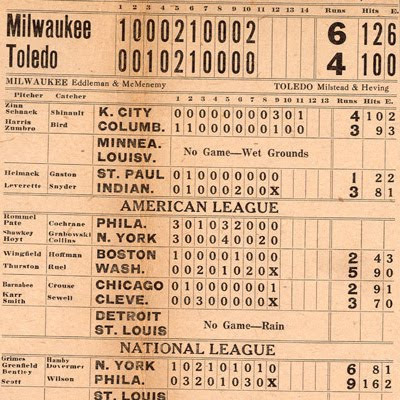 It appears to have been unique to the Cream City's baseball (and tavern) culture, combining two of the things Milwaukeeans love so much. I picked up a lot of these off ebay a few years back. The actually made a comeback - although published by a different outfit - in the 50s. The most recent one is from the '58 World Series. I have one from '24 (i think) as well with the same Gayety ad. In the late '20s, Mayor Hoan was having that place watched by the vice squad after a couple of dancers were arrested there for "indecent exposure." I'd love to see some scans of yours. Sounds like the Gayety is a better story than I realized! I am afraid they are too large for my scanner. Another interesting note on them - a few of mine noted Al Simmons home runs, even when not mentioning homers other players had hit. Always keeping tabs on the local boy, I suppose.